The Multimedia Department at Berkeley City College cordially invites you to attend this year’s Multimedia Student Showcase at Berkeley City College, 2050 Center Street in Downtown Berkeley on Friday, May 2, 2014. Doors open at 6pm. 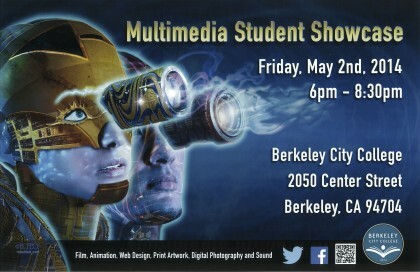 This year’s showcase features digital printing, digital photography and fine art, as well as 2D/3D animation and live action video. Our special guests are Tom Miller from Pixar and filmmaker Paige Bierma. Tom Miller has been a set artist and technical director at Pixar Animation Studios for the past 12 years, working on such films as Cars, The Incredibles and Up. Paige Bierma is an award-winning video producer, journalist, documentary filmmaker and an Alumna of the BCC Multimedia Arts Video Production Program. Her latest documentary, A Brush with the Tenderloin, aired on KQED’s “Truly California” series and then won an Emmy Award in June 2013.